Manic behavior holds an undeniable fascination in American culture today. It fuels the plots of best-selling novels and the imagery of MTV videos, is acknowledged as the driving force for successful entrepreneurs like Ted Turner, and is celebrated as the source of the creativity of artists like Vincent Van Gogh and movie stars like Robin Williams. Bipolar Expeditions seeks to understand mania's appeal and how it weighs on the lives of Americans diagnosed with manic depression. Anthropologist Emily Martin guides us into the fascinating and sometimes disturbing worlds of mental-health support groups, mood charts, psychiatric rounds, the pharmaceutical industry, and psychotropic drugs. Charting how these worlds intersect with the wider popular culture, she reveals how people living under the description of bipolar disorder are often denied the status of being fully human, even while contemporary America exhibits a powerful affinity for manic behavior. Mania, Martin shows, has come to be regarded as a distant frontier that invites exploration because it seems to offer fame and profits to pioneers, while depression is imagined as something that should be eliminated altogether with the help of drugs. 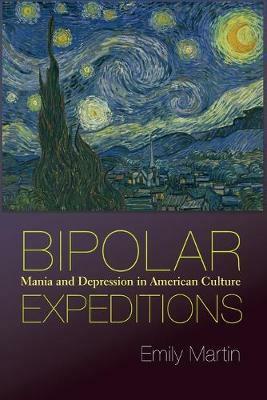 Bipolar Expeditions argues that mania and depression have a cultural life outside the confines of diagnosis, that the experiences of people living with bipolar disorder belong fully to the human condition, and that even the most so-called rational everyday practices are intertwined with irrational ones. Martin's own experience with bipolar disorder informs her analysis and lends a personal perspective to this complex story. Illustrations note 19 halftones. 6 tables. Emily Martin is professor of anthropology at New York University. Her books include "Flexible Bodies: Tracking Immunity in American Culture from the Days of Polio to the Age of AIDS" and "The Woman in the Body: A Cultural Analysis of Reproduction".